On a 4 to 5-kilometer stretch of road in Phan Thiet City’s Ham Tien Ward, a “Russian village” has emerged amid the cluster of resorts. There, the signboards advertising services and restaurant’s menus are written in Russian as well as Vietnamese. The number of Russian visitors to the central coastal province of Binh Thuan has surged rapidly, with 48,200 Russians visiting there in the first four months of this year, accounting for 37.6 percent of foreign tourists to the province. Russian tourists in Mui Ne in Binh Thuan Province's Phan Thiet City. Nguyen Dai Lam, an owner of the Tigon Spa on Nguyen Dinh Chieu Street – the only through street in Ham Tien, said he has had the price list for the services he offers translated into Russian. He has also pasted an advertisement in Russian on the spa’s glass door. “Russian tourists are very willing to spend money. We only need to serve well and they will come to us during the whole tourism season without bargaining. However, we inconvenience them by using English,” Mr. Lam said. Most of restaurants, shops and services on this tourist street have menus, signboards and price lists in three languages: Vietnamese, English and Russian, he added. 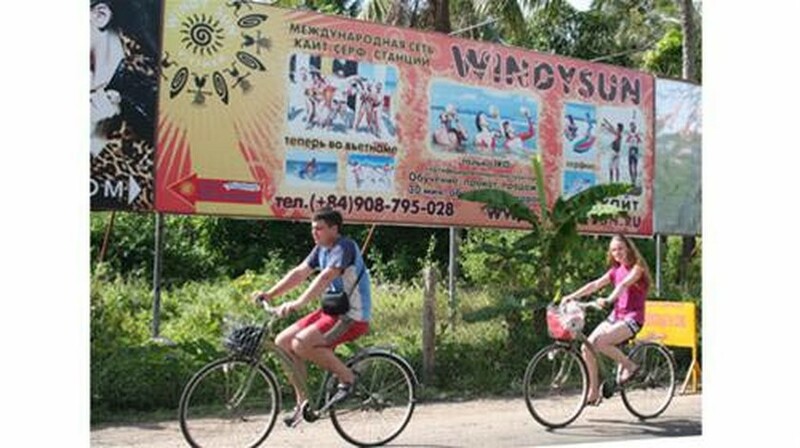 Ham Tien suddenly started receiving more Russian tourists a few years ago, when tourist agencies offered services used only English to advertise their tours to beach and sun lovers around the world. Then the Russians started arriving in droves and Nguyen Dinh Chieu Street became a Russian village in next to no time. Danila Pechenin, a guide at the Windy Sun paragliding camp in Ham Tien, came from Moscow, Russia. Russians usually flock to Mui Ne from September to March to enjoy warm sunshine and play water sports as a way to escape winter. They are famous within the haven of resorts for usually staying of no less than seven days per stay. Many families and tourist groups even stay for a month, to enjoy windsurfing and paragliding. Many owners of fine arts shop on Nguyen Dinh Chieu Street said Russian buyers are willing to spend more money than most. Staying for extended periods, indulging in luxurious services and recklessly spending in general have made Russians most welcome within Mui Ne’s heavenly array of resorts. In late 2009, the Tam Nhin Xa Company published the Muine.ru newspaper, circulating 3,000 copies per monthly edition, to promote Mui Ne’s tourism options. The newspaper, which is one of the official publications given free to tourists, is in Russian and has 30 pages. Russian people don’t only arrive in Mui Ne to hide from harsh winters and seek thrills in water sports, but also live normal lives amongst local residents. “The spa is very crowded with Russian customers because the boss is a Russian, and especially, he can speak Vietnamese a little bit so that he can instruct us, Vietnamese staff, to do what Russian customers request,” she said. Many shops and services in the village are run by Russians in conjunctions with Vietnamese people. Ham Tien people have also started to exploit opportunities in the village, writing signboards in Russian and young people learning Russian pidgin from Russian tourists which helps them better serve Russian visitors. Many restaurants and bars are decorated with matroska dolls and pictures of famous buildings from Moscow’s Red Square, with Russian songs playing in the background. Dima, a Russian, introduces that night’s music performance at Déjà vu restaurant in Mui Ne to a countryman. Nguyen Van Khoa, chairman of Binh Thuan Tourism Association, said the number of Russian visitors to the province has been increasing by 20-30 percent per year. According to the Binh Thuan Department of Culture, Sports and Tourism, the province received 57,000 Russian visitors in 2009, accounting for 25.7 percent of the province’s total visitors. The figures were 48,200 and 37.6 percent in the first four months of 2010. 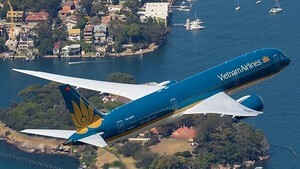 Hoang Thi Phong Thu, chairwoman of Lanta Anh Duong Travel Company’s management board – one of the companies focusing on Russian tourists, said most of Russians arrive in Vietnam via direct charter flights from their homeland. She said her company serviced, on average, one charter group every 11 days in 2009. However, the company has received two groups a week since early this year. Some Russian tourists come with their families, some with their friends, and many have returned to Binh Thuan after their first visits, she added. Tourist agencies said Russian people previously traveled to Thailand and other regional countries as their warm weather holiday destination. Recently, many have traveled to Binh Thuan Province thanks to Russia-Vietnam direct flights and the province’s tourist advertisements. While it has been forecasted that the number of Russian travelers to Mui Ne will continue to soar, at present, there is a shortage of skilled labor who can speak Russian. Tourist companies and resorts are seeking to employ people who have worked or studied in Russia and Russian people working in Vietnam. They have also had their information, notices, websites and advertisement leaflets written in Russian to welcome Russian tourists.